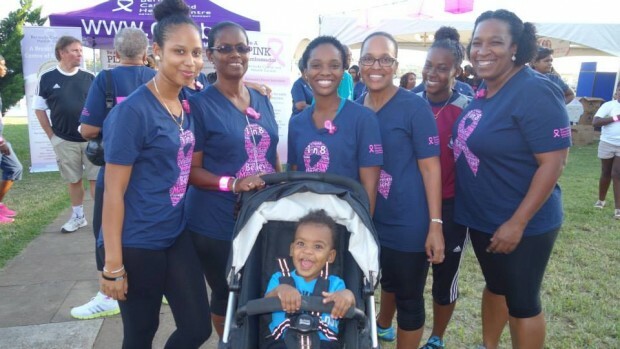 BF&M Limited, in conjunction with the Bermuda Cancer and Health Centre, hosted its 18th annual Breast Cancer Awareness Walk yesterday [Oct 27], bringing together people from around the island in order to enjoy a healthy evening even while raising money for charitable outreach initiatives, including the company’s Equal Access Fund and Education and Awareness Programmes. Previously scheduled for October 22, the event was postponed to October 27 due to the impact of the two back to back storms. A spokesperson previously said, “Collect $166 in pledges and you will cover the cost of a mammogram for someone who cannot afford one. Raise over $166 in pledges and your name will be entered in a draw for a fabulous pink leather bag. Cancer.bm describes the walk’s itinerary by saying, “All funds raised will support our charitable outreach initiatives which include our Equal Access Fund and our Education and Awareness Programmes.